Time: 40 minutes to 1 hour. Terrain: Forest track and country road. This cycle route may be short, but it’s a gem. It offers stunning scenery, epic views, a loch, a ruined castle and some great, but not too challenging, off-road riding. It’s one that all the family can tackle. It’s mainly forest track with a short section on a quiet country road. The terrain is best suited to a mountain bike, but you can get away with a sturdy hybrid or touring bike as long as it’s not too wet – just watch out for the potholes! As this is a working forest, please be aware that timber operations may be in progress and obey the advice signs that will be displayed if work is in progress. 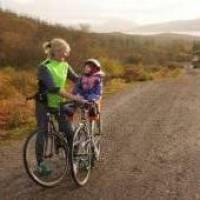 Start your cycle at the Portavadie Ferry Terminal. Passing Glenan Wood on your left and thePortavadie complex on your right, head up the road towards Tighnabruaich. After a short climb, turn left off the road onto a forest rack signed ‘Cowal Way’ and ‘Road to Ascog’. After 200 metres or so you’ll pass the Wood Chip Shop, where timber from the forest is processed. Carry on up the track and over the burn. To your left is a lovely section of ancient woodland – a real delight among the plantation of Sitka Spruce and Larch. In spring it’s worth making a short detour on foot to see the carpet of bluebells. Back on your bike, dig deep as it’s a fairly steep, gravelly climb up the hill. You’ll pass the cottages at Derybruich on your right. Continue along the track, looking back for a stunning view of Loch Fyne, Kintyre and Arran in the distance. Ahead of you to the right is the summit of Barr Nan Damh. Carry on past a turning circle and take the forest track to the right. It’s about a mile from the Wood Chip Shop. The next bit of track is cracking. It winds its way along the hillside offering wonderfully elevated views of the surrounding hills and water. In the distance ahead of you is the north end of Bute and beyond that, the uplands above Colintraive. You’ll reach the highest point of the route here after which let gravity do some of the work and soak up the views. Keep an eye out for deer, red squirrels and birds of prey. Outside of the winter months, when the sun is warm enough, you may even spot an adder basking on the track – we did! As you spin downhill, you’ll catch your first glimpse of Loch Ascog, keep bearing to the right, ignoring a fork to the left. As the track levels out you’ll pass a standing stone (not an ancient one!) before following the road as it bends to left. Ignore the track that forks off to the right signed ‘Cowal Way’. After a short downhill section you’ll soon meet the main track that leads back to the road. To return to the road, follow this track to the right. Turn left for a quick detour to Loch Ascog and Ascog Castle. The ruined castle dates back to the 15th century and was the ancestral home of the McInnes Lamonts. The Lamonts of Ascog are on record in 1477, but there is indication that the square keep of the castle is of an earlier date. The castle was destroyed by the Campbells of Ormsary during the 1646 massacre, where over 100 clansmen were taken to Dunoon and either hanged or buried alive. There’s not much left of the castle today, but in contrast to its violent past it’s a tranquil place to draw breath. If you made the detour, retrace your steps back to the track and follow it for about half a mile until you reach the road. There’s a bit of a climb involved, but you’re rewarded with a fine view of Arran and Kintyre. Turn right onto the road and pedal downhill. After a short time, turn right again, following the signs to Portavadie and Glenan Wood. Grab yourself some well-earned refreshments at Portavadie. The Lodge is great for hearty home-cooked meals in relaxed, family friendly surroundings. Head to the Portavadie Leisure Café for delicious ice cream sundaes and home-baked pizzas. You can also hire mountain bikes at Portavadie and pick up a few cycling accessories such as gloves at the Portavadie shop. Please note that this is intended to give an overview of the cycle route. Always check the route yourself and take a map with you.